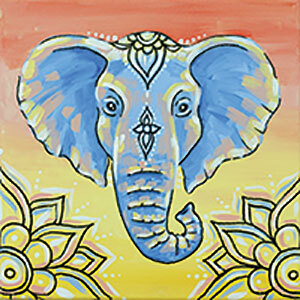 The Colorful Elephant Canvas Family Painting | Mix It Up! Come in and paint “The Colorful Elephant” with us! One of our fun instructors will paint along with you, teaching you step by step over the course of this two hour event. We provide all the materials necessary to create your one of a kind piece that is ready to take home at the end of the event. We encourage you to invite your family, friends, and coworkers. We promise we won’t disappoint. Family painting classes are fun for the whole family (ages 6 and above) and are designed for families to enjoy time painting together. For the enjoyment of all of our guests, non-painting parents are not able to sit with their child, nor “share” a canvas. Seating for non-painting parents may be available in the back of the studio but is not guaranteed. Children under 13 must be accompanied by an adult. Family Day pricing is already discounted so no other discounts can be applied to this class.